​Article type: Research article, Received: 22.12.2018, Revised: 28.02.2019, Date of Publication: 14 March 2019. Development Studies Discipline, Khulna University, Khulna, Bangladesh. Faecal sludge management (FSM) has conquered notable recognition by all authorities for its importance. Because it has large scale impacts on human-environment. This study was an initiation to explore the current situation and the prevalent practice of FSM among slums people of Khulna city-Bangladesh. Applying face-to-face interview technique household survey was conducted through a structured questionnaire, where 104 participants were purposively selected for taking interview. This study was carried out in slums area of Khulna city Bangladesh. The people of Khulna particularly slums people are not so aware of using sanitation properly. Findings of this study exerts that a very large portion of slums people here are having not enough knowledge about sanitation issues and Faecal Sludge Management. Off the 100% (92/82.5%) respondents of the study area have never taken any training on FSM. A large volume of people used to use community latrine, where lack of privacy, scarcity of water, absence of hand wash facilities and unsafe manual emptying are still the major problems. Until now a large number of toilets are directly connected to drain, and whereas 23 (22%) asserted that human excreta directly goes into open water i.e. (river and pond that so deplorable. The result elucidates that within (1 or 2 years) (75/72.12%) septic or other tanks didn’t get emptied whether (18/62.07%) were unfilled through unsafe manual process. In fine, it can be said that alongside arranging different awareness programme alternative small emptying devices like Vacutug must be arranged here with low cost for the disadvantaged. Therefore, a comprehensive detailed scientific study demands this sector for further designing any strategic plan. Hasan et al. “Community faecal sludge management strategy among urban slum people of Khulna city-Bangladesh.” Journal of Science, Technology and Environment Informatics 07(01) (2019): 489-499. Hasan, M. M., Husna, A. U., Rahman, M. A. and Alam, M. A. (2019). Community faecal sludge management strategy among urban slum people of Khulna city-Bangladesh. Journal of Science, Technology and Environment Informatics, 07(01), 489-499. Hasan, M. M., Husna, A. U., Rahman, M. A. and Alam, M. A. “Community faecal sludge management strategy among urban slum people of Khulna city-Bangladesh.” Journal of Science, Technology and Environment Informatics 07(01) (2019): 489-499. Hasan, M. M., Husna, A. U., Rahman, M. A. and Alam, M. A. 2019. Community faecal sludge management strategy among urban slum people of Khulna city-Bangladesh. Journal of Science, Technology and Environment Informatics, 07(01), pp. 489-499. Hasan, MM, Husna, AU, Rahman, MA and Alam, MA. Community faecal sludge management strategy among urban slum people of Khulna city-Bangladesh. Journal of Science, Technology and Environment Informatics. 2019 March 07(01): 489-499. BD FSM Network (2016). Workshop paper: Bangladesh FSM convention (2016), Organized by Bangladesh FSM Network. BNBC (2014). “Bangladesh National Building Code”, Ministry of Housing, Bangladesh. Islam, M. (2016). 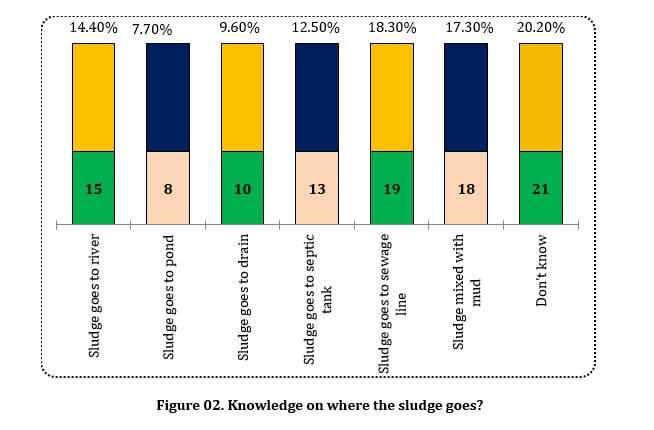 A comparative study on faecal sludge management in three municipalities of Bangladesh (Masters Research Paper, Khulna University of Engineering & Technology (KUET)). Kabir, A. and Salauddin, M. (2014). A baseline study to assess faecal sludge management of residential premises in selected southern cities of Bangladesh. SNV Netherlands Development Organization. KCC (2017). “Basic statistics of Khulna city corporation”, Ofﬁcial website of KCC. Retrieved 10 November 2018 from www.khulnacity.org/Content/index /About_KCC. Mondal, S. (2018). Faecal Sludge Management in Khulna City: An approach for safe emptying. Master thesis, Khulna University of Engineering & Technology (KUET). Opel, A. Bashar, M. K. and Ahmed, M. F. (2011). Landscape analysis and business model assessment in faecal sludge management: extraction and transportation models in Bangladesh. WaterAid Bangladesh, Dhaka. Repon, A. C. Faruq, O. and Mamtaz, R. (2015). Occupational safety and health guidelines for faecal sludge management. SNV Netherlands Development Organization. Singh, S. Patro, S. Dey, S. Mohan, R. R. and Rathi, S. (2017). 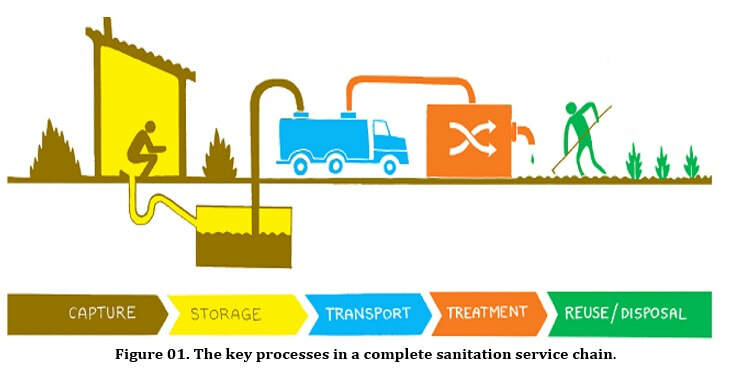 Technology options for the sanitation value chain. Center for Study of Science and Technology (CSTEP). Bangalore, India. Tilley, E. (2014). Compendium of sanitation systems and technologies. Eawag. UN-Water Decade Programme on Advocacy and Communication (UNW-DPAC), (2009). The Human Right to Water and Sanitation Milestones. Retrieved from http://www.un.org/waterforlifedecade/pdf/human_right_to_water_and_sanitation_milestones.pdf. WASH (2011). “Low-cost systems for the management of sludge from toilets and shower units”. Current Techniques and Improved Options in Madagascar.